Home Tags Posts tagged with "Eurozone Crisis"
I had the pleasure of attending a UCLA Center for European and Eurasian Studies (CEES) book talk with author Ivan Berend of the UCLA History Department. He invited discussant Stefan Biedermann, Deputy Consul General of Germany in Los Angeles to join him. Berend’s book Europe in Crisis: Bolt from the Blue? described the history of the present financial crisis in Europe. He offers some policy and economic prescriptions to help the European Union emerge from the crisis with strength, peace and dignity. Berend starts by referencing a Joseph E. Stiglitz quote which states that the financial crisis was “made in the U.S.” Berend disagrees. He argues that despite the prevailing wisdom that says the crisis was borne of Wall Street, indeed ten of the eleven European Union countries caused their own crisis. Specifically, Mr. Berend feels that, in the lead up to 2008: Iceland had relied on a system of irresponsible banking, Greece was engaged in chronic irresponsible government spending, and Ireland was feverishly caught up in reckless consumer spending. Britain, Spain, Portugal, Hungary, Latvia and Romania he argues were similarly adrift. He backs his statement regarding Greece by citing their national retirement ages, in some cases as young as 48 years. A perhaps telling public spending gaffe during the 2004 Olympics allowed a $2.5 billion construction budget balloon to over $10 billion. When put into context with the widespread abject poverty so many Greeks are living in today, this opulence seems absurd. Connecting the European financial crisis to the global one, Berend gives the Lehman Brothers collapse and ensuing Wall Street panic credit for freezing international liquidity flows. This triggered a financial collapse, which in turn triggered the recession where the “real economy”–like industry, agriculture and the service sector–faltered. An oddity among the twelve nations was Poland, which escaped the global crisis unscathed. This was not the case for most European countries, which ended up with a 14% reduction in Gross Domestic Product (GDP). Since the beginning of the recession, six countries were bailed out. Complete repayment seems unlikely as these sovereign are currently only able to pay the interest on these loans. So, what happened? First, globalization spread everywhere with its international interlinked finances. Secondly, neoliberal economics happened. Proponents of this economic ideology had declared victory over Keynesian economics and claimed there would be no more economic cycles. Berend clarifies that European economic shifts exacerbated the problem. There was a 27% drop in industrial employment. In fact, finance, insurance, and real estate (or F.I.R.E.) were bigger sectors of employment than manufacturing and had grown six times faster than industry, agriculture and services. The other contributing culprit to the financial collapse was the destruction of enforced regulation. With waves of neoliberalism in America, England and Germany, regulation had been essentially eliminated from the 1980s onwards. Champions of deregulation were Reagan, Thatcher, and Chancellor Kohl. Hedge funds became gambling institutions that won regardless of whether investors won or lost. Consequently, fund managers became eager to attract risky high yield investments. At the European Union’s (EU) very inception, Berend refers to the Euro currency and economy as a “birth defect” in that there was monetary unification without fiscal union. This was a problem because every country was totally different, each with its own fiscal traditions, taxation, and government policy. Greece and Italy had massive non-taxable informal “black economies”. Systemic tax evasion defined Greece and Italy as well during this period. Berend says this was not so for the core countries of the EU like Germany and France. Berend suggests that the solution to the crisis is to reintroduce regulation and supra-national control. He envisions a “European System of Financial Supervision” for early warning. Furthermore, he feels austerity measures integrated with growth policies should be a part of bringing Europe back to financial health. To reign in the peripheral countries like Greece and Italy, Berend prescribes a limit to credit extensions. He goes on to say that any level of credit will be maxed out and spent regardless of ability to pay the loans back. For the long-term, Berend suggested that quasi fiscal unification could be healthy. His suggestion calls for a movement toward federalization with all budget policy being centrally guided. Finally, Berend calls on the Euro zone to set up a two-tier union in which some more fiscally solid countries join the “fast track” and others participate at a level commensurate to their stability. Biedermann predicts that the EU will emerge stronger out of this crisis. He hopes that the experiment of bringing a continent together in peace will work. The “United States of Europe” is his vision for peace in the future. Despite the anti-austerity protests from thousands of unemployed Spaniards in recent months, Spain is moving towards cutting social programs in its most severe austerity budget plan in history in order to receive bailouts for its banks and government debt. Spain is considering to apply for the Enhanced Conditions Credit Line (ECCL), a euro-zone bailout fund that would grant money to Spain’s government with the condition that it imposes more fiscal austerity. More than $50 billion worth of budget cuts in education, healthcare, welfare, and pensions are expected and unemployment benefits and civil servant wages have already frozen. Another problem that the Spanish youth faces stems from the housing bubble that burst in 2008. When Spain joined the euro in 1999, low interest rates brought banks to lend an unprecedented number of property loans and the boom years of this period caused wages to rise quickly within the labor market. As a result, Spain has been exporting less of its own, more expensive goods and importing more of cheaper products from its European counterparts. This trend resulted in Spain’s government overspending, but more importantly, Spain’s labor market became highly uncompetitive. 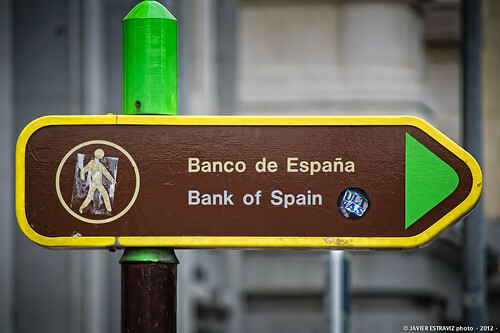 However, the general trend throughout the world, not just in Spain, has been that bailing out banks has preceded the need to support social programs. The banking system has become monopolized so that banks are too large to fail when they are in trouble. Smaller banks around the world have merged together into larger banks in order to increase their assets to a point where defaults in these banks can risk a financial collapse. In addition, the risk of having these banks default could lead to a greater catastrophe of foreign investors pulling out their money from banks and government bonds. No investments cause reserves of banks to shrink, which would in turn increase interest rates and stiffen lending to consumers. Therefore, the banking system has become so essential to capital of the economy that bailouts have become the insurance banks can rely on when their loans are in trouble. As a prime example, Spain’s government is applying for an ECCL to bring foreign investors, or at least keep the ones it already has, and maintain its credibility to repay debt. Moreover, if there are no foreign investors, there is a risk that Spain will default on its loans to France and Germany, which can spread Spain’s economic crisis into an epidemic throughout Europe. Consequently, further downgrades of Spain’s bonds—which are currently one notch above junk status according to Moody’s and Standard and Poor’s—will not only drive foreign investors further away from its bond market, but also bring other European Union countries down with it. For these reasons, although banks are responsible for the housing bubble, they will receive the aid that they need even though austerity measures will make taxpayers’ lives harder. Since big banks are nearly guaranteed bailouts, there are no incentives to prevent banks from issuing out risky loans when the economy recovers and interest rates are low again. But for how long can this vicious cycle last? Already there are violent protests of hundreds of thousands all around the world. If governments wish to ensure the future of its citizens, the cries of the poor, young, and unemployed must be heard. A strong, competitive labor market is what will bring revenue and ultimately restore the economy. Spain can start with not cutting social programs that are the support systems for the thousands of unemployed and struggling citizens. Secondly, laws must be set in place to prevent unions from not hiring the unemployed youth in Spain. Thirdly, although bailouts must be administered, social programs should take priority before banks are given aid. Finally, there must be laws or a set of incentives that will prevent banks from giving out such toxic loans that start such housing bubbles and financial crises. The people of Spain have been hurting long enough and it is time the government supports and invests in the people who can restore the economy for what it once was. Tina Kim is a second year Communications major and Public Policy and Urban Planning double minor. She is a co-editor and writer for The Generation. “Within our mandate, the ECB is ready to do whatever it takes to preserve the euro. And believe me, it will be enough,” Mario Draghi, President of the European Central Bank (ECB), stated on July 26, 2012. What was once a question of Greece leaving the European Union (EU), commonly known as “Grexit,” has now evolved into the question of breaking up the entire EU. The ramifications of multiple countries leaving the EU, or even one country leaving, would be felt in economies around the world. But, as Draghi states, European leaders are looking beyond this possibility to continue to work towards healing the crises in Europe. The common belief thus far, shared by economists, leaders, and the public, has been that Greece would be the first to leave. Greece, the first EU country to suffer drastic economic setbacks, had accumulated large government debts prior to the economic downturn in 2008. The weak fiscal policies could not generate enough revenue to cover the high rate of borrowing. In 2009, its debt was 113% of Gross Domestic Product (GDP), putting it in a weak position to overcome the hit to its markets. Elsewhere in the EU, Spain is trying to avoid becoming a second Greece by announcing harsher austerity measures that will increase taxes and cut spending at the local levels. Spain is in a risky position—the interest rate for its 10 year government bonds is passing 7%, signaling investor hesitation and long term instability. If investors are reluctant to put money into bonds, Spain will not get the money it needs to bail out banks. While some options are still on the table for countries like Spain, the actions taken in Greece will set an important precedent. The idea of Greece potentially leaving the EU raises three questions: (1) Will Greece leave the EU? (2) Should Greece leave the EU? (3) If Greece leaves the EU, does it pave the way for progress? The Greek elections on June 18, 2012 indicated a positive sign for Greece with the victory of the New Democracy. The party is in support of bailouts and implementing austerity measures to ensure that a “Grexit” does not take place. Even though the win represents a positive political shift in Greece, strong fiscal measures will be needed to lift Greece out of the economic depression. The two bailouts Greece has received amounted to more than 250 billion euros and aid continues to flow in the form of loans. Thus, in the short term, Greece is safe. The new government and new measures put into place will test how much longer Greece can sustain its EU membership. Although some economists and analysts believe that Greece leaving the EU could be beneficial, an exit will be costly for Greece and its neighboring countries. If Greece leaves the EU, the first hurdle it will face is a drastic devaluation of its currency. With the euro, the currency valuation rests on the economic well being of 17 countries—out of which a few still show signs of economic growth. Without this buffer, the Greek currency will be extremely weak and vulnerable to hyperinflation. Greece’s primary industries of tourism and shipping are insufficient to support Greece on their own. Second, as seen in the past, drastic devaluation of currencies results in shortages, inflation, and eventually, political fallout. Economic instability has historically been a cause of political shifts and unrest. This will only lead to rebellion and violence, endangering Greek citizens and citizens of neighboring countries. What really lies at the core of the crises? A more basic change that needs to occur in order to prevent these economic problems. Amongst the countries using the euro, we see many fiscal divisions that will not be solved by Greece leaving the EU. The fundamental problem lies in the way fiscal policies are implemented. A central bank, like the European Central Bank (ECB), has two main responsibilities: monetary policy and fiscal policy. The ECB carries out monetary policy but it lacks consistent fiscal policy—taxing and spending. The root cause of the Greek crisis was the increasing debt due to a small influx of taxes that was not enough to cover the excessive spending attributed to Greek wage and pension requirement. Thus, the ECB should maintain greater oversight over the types of tax policies and spending policies put into place by individual governments. If multiple countries are employing the same currency and some countries are undermining its value through ineffective fiscal policy, it can create a harmful domino effect. The answer to all three questions stated earlier seems to be a “No.” Furthermore, an exit from the EU would set a bad precedent for other countries. An exit does not guarantee economic progress or serve as hope of calm in the midst of chaos. Economic recovery due to large budget deficits and extensive borrowing requires intensive reform that imposes strict consequences for excessive deficit spending. Draghi establishing his stance on this issue is an important step in not only giving investors hope that Europe has not given up in its fight, but also hope for the people of Greece and the EU that their government and the ECB will continue to support their needs in a time of crisis. Figures obtained from BBC News, Forbes, and the Wall Street Journal. Trisha Parikh is an undergraduate student at UCLA majoring in Economics and Political Science. She is a co-editor with The Generation.